What you should be doing and what to expect out of your landscape this summer. Finally, it’s warm! YAY! But in true Texan form, we will all be complaining in 3 weeks about how hot it is. Isn’t that an oddity? It never fails, e v e r y s i n g l e y e a r we have something to say about our weather and how we CAN’T BELIEVE that it’s this hot! Didn’t Albert Einstein once say that doing the same thing over and over again and expecting a different result is the definition of insanity? We must be…. Anyway, now that the temperatures are rising what can you be doing to ride the wave of weather change? Water is life. Without water we perish, along with any other living organism on this earth. Proper watering practices not only bring life to plants but sustain their health. It can alleviate compaction, nutrient deficiencies and also prevent certain diseases. It is extremely imperative to maintain a balanced watering regimen if you are concerned about the health of your plants. Maintaining this balance will also help reduce the overuse of water and if you are on our Soil Building Program, will allow you to get the most benefit from our treatments. Over Watering Vs. Under Watering – Is one better than the other? In regards to turf, it all depends on your variety. Bermuda responds much better to over watering than under. St. Augustine on the other hand is quite the opposite. Over watering St. Augustine can dig you into a hole that is much harder to get out of than it was to get in. In St. Augustine lawns, overwatering can cause a dreaded fungal disease called Rhizoctonia – AKA Brown Patch. While Brown Patch does not kill the grass, it leaves it leaves an unsightly appearance and the affected areas are slower to green up in the spring. It is crucial to maintain proper watering practices while still considering what mother nature brings to the table. This can get hard, right? Some of you may never be able to tell if you’re watering enough or too much. Don’t fret! 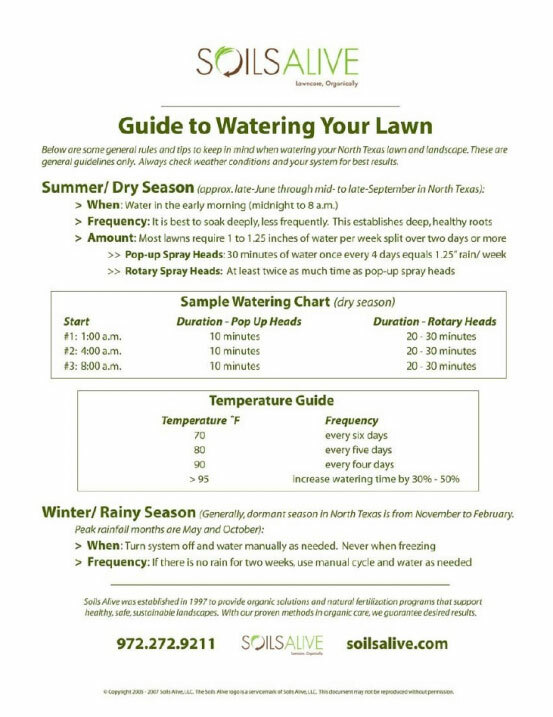 We’ve got a perfect guide that is black and white when it comes to watering your lawn. Weed Alert! Our Summertime Nuisances! 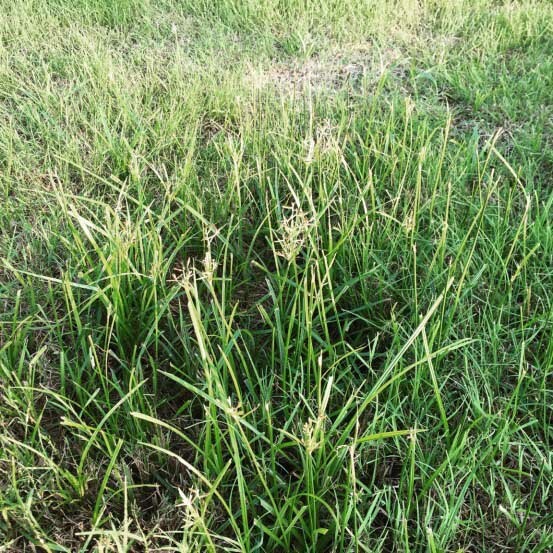 Crabgrass is a thorn in a lot of homeowners’ side come summertime. It usually appears in May and sticks around throughout the end of the year. Crabgrass grows in a clumping manner and the runners branch out much like the legs on a crab. 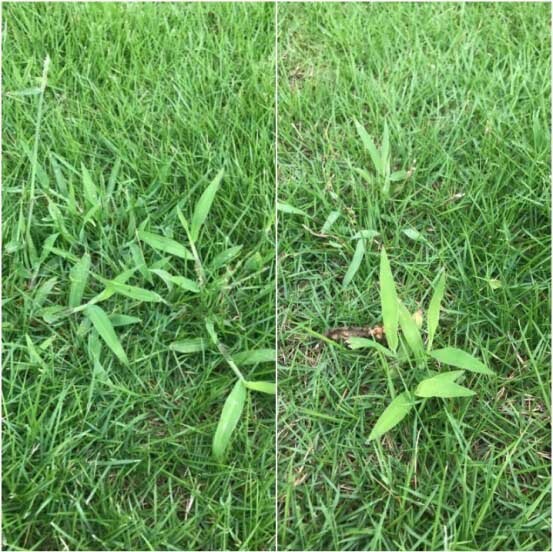 If you prefer to steer clear of chemicals, the best natural way to get rid of crabgrass is to cut it off at the crown (flush with the ground). This kills the weed and leaves the root intact to decompose and feed the soil. Win Win! Nutsedge made an earlier appearance than normal this year. It usually shows up around May but started popping up in March this year. The blades appear to be long, skinny and dark green. Some may consider nutsedge to be a weed while others respect it as a natural addition to the polyculture that your landscape is intended to be. If you want this weed gone, whatever you do, DO NOT PULL IT. Nutsedge germinates through agitation. If you are on our program and notice you have nutsedge, give us a call. Nutsedge requires an additional charge to treat but we can eradicate it. If you see this weed, don’t pull it! Less Is More in Texas Landscapes! In this day and age we are all about finding ways to make our lives easier. Naturally, that is the reason why most of you hire someone to do your lawn care maintenance for you. If you are one who has a hard time keeping up their end of the lawn care maintenace deal (i.e. watering), try planting Native Texas Plants. Any native varieties require little to no maintenance and are a beautiful addition to any landscape. Some of my favorites are: Texas Sage, Bird of Paradise and Vitex. Hardscapes also call for less maintenance which means spending less money! Plus, weeds and diseases are most of the time non-existent so you can still have the prettiest lawn on the block!